B-glowing has introduced two new collections of solid twist-up perfumes from Crazylibellule & The Poppies, Les Divines Alcoves and Poule de Luxe. Presque Nue [shown] ~ With top notes of bergamot, ylang ylang and neroli; heart notes of jasmine, dasmas rose, lily and violet; and base notes of sandalwood, amber and musks. Amoureuse ~ With top notes of berry and black pepper; heart notes of rose, tea and jasmine; and base notes of musk, patchouli, sandalwood and vanilla. Aux Anges ~ With top notes of bergamot, tangerine, ylang ylang; heart notes of jasmine; and base notes of jasmine and white flowers. Dans tes Bras ~ With top notes of juniper berry and pink berry; heart notes of peach, cedar and patchouli; and base notes of amber and musks. Le Baiser ~ With top notes of bergamot and jasmine; heart notes of rose, iris and violet; and base notes of sandalwood and vanilla. Toi Mon Prince ~ With top notes of bergamot, berry, tangerine and mango; heart notes of almond jasmine, apricot and damas rose; and base notes of sandalwood, musk, white peach and patchouli. Tout Oublier ~ With top notes of bergamot and tangerine; heart notes of rose, ylang ylang and iris; and base notes of violet, cedar, amber and musks. Vanilla Moka [shown] ~ With top notes of dark chocolate, cocoa bean; heart notes of sandalwood and mocha; and base notes of coffee liqueur and musk. 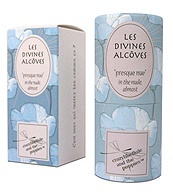 Vanilla Pralines ~ With top notes of caramel and hazelnut; heart notes of pecan pie; and base notes of musks. Vanilla Sucre Glace ~ With top notes of bergamot and tangerine; heart notes of jasmine and orange flower; and base notes of musk, vanilla and caramel. 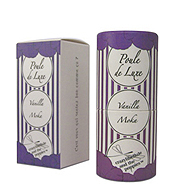 Vanilla Pom d'Amour ~ With top notes of tangerine and rum; heart notes of hawthorne, peach and red fruits; and base notes of licorice, musk and vanilla. Vanilla Fruit Sorbet ~ With top notes of raspberry and rose; heart notes of raspberry and iris; and base notes of raspberry, vanilla and musk. Vanilla Lemon Pie ~ With top notes of orange and neroli; heart notes of almond and caramel; and base notes of heliotrope and vanilla. Vanilla Macarons ~ With top notes of almond and amaretto; heart notes of cedarwood and sandalwood; and base notes of vanilla, musk and amber. All of the scents are in 5 gr solid for $16 each. See also: the CrazyLibellule & The Poppies Shanghaijava Collection, review of Encens Mystic.